We’d love your help. Let us know what’s wrong with this preview of The Promise of Elsewhere by Brad Leithauser. Louie Hake is forty-three and teaches architectural history at a third-rate college in Michigan. His second marriage is collapsing, and he's facing a potentially disastrous medical diagnosis. In an attempt to fend off what has beco A comic novel about a Midwestern professor who tries to prop up his failing prospects for happiness by setting out on the Journey of a Lifetime. 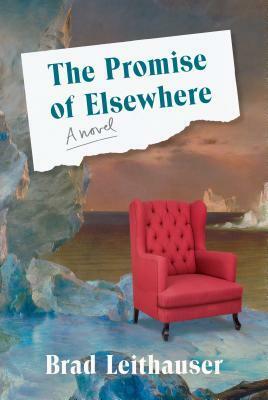 To ask other readers questions about The Promise of Elsewhere, please sign up. A review in the Chicago Tribune piqued my curiosity about this book, with travels to Rome, London and Greenland featured in the story line. Having been to the first two places and wanting to get to the last, I was interested in reading about the main character's experiences in each. Louie Hake is the middle aged traveler who heads out into the world from his home in Michigan where he has been a architectural history professor at Ann Arbor College for his entire career. His second wife Florence h A review in the Chicago Tribune piqued my curiosity about this book, with travels to Rome, London and Greenland featured in the story line. Having been to the first two places and wanting to get to the last, I was interested in reading about the main character's experiences in each. Louie Hake is the middle aged traveler who heads out into the world from his home in Michigan where he has been a architectural history professor at Ann Arbor College for his entire career. His second wife Florence has just left him for another man who is the director of a local theater group and Louie has recently been diagnosed with a rare neurological disease which is leading to blindness. He's also bipolar. He has no children. He is close with his older sister who is a force of nature and who follows her brother's world travels through a very detailed collage she has created on her refrigerator door. His original plan was to visit Italy, Turkey, India and Japan to see great architecture, but after his time in Rome doesn't go as well as he'd hoped, he changes course and flies to London next. He meets some interesting people along the way, including a robust 29 year old woman who is in London on her honeymoon without her groom who changed his mind about marriage a week or so before the wedding. The groom's mother is a travel agent who commiserates with the jilted bride and insists that her "almost daughter-in-law" go on the trip anyway since it's all been paid for. Louie and the bride find solace in friendship. Louie changes plans again and opts out of Turkey, India and Japan to travel instead to Greenland via Iceland, where he is sick most of the time, meets a very strange failed atomic physicist and rents a room at the Rotten Egg in the small town of Qaqqatnakkarsimasut. He lays about for the most part in pretty squalid surroundings until he finally finds bliss on a trawler out on the ocean where he gets to witness fantastic icebergs like the kind painted by Frederic Church many many years ago. Masterful writer. Will definitely read other works. This novel offers a journey on many levels, woven nicely throughout.